Cheerful images offer word sound cues to delight early learners. 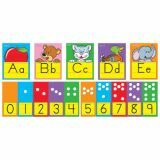 Includes 26 alphabet cards, 6 1⁄2" x 8 1⁄2" each, and numbers 0-9 with counting dots on 2 strips. Complete set is 17'L. 28 pieces. Whimsical animals and words provide cues. 26 alphabet cards, 6 1⁄2" x 8 1⁄2" each. Includes numbers 0-9 with counting dots. Complete line is 17'L. Includes numbers 1-10 and a Discover Guide filled with information and activities. Line is 18' long and 7-3⁄4" high. 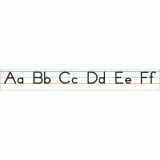 Display proper handwriting formation as a handy reference for students! 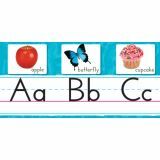 Manuscript Alphabet comes complete with a frame and arrow that can be used to highlight a letter of the day! Includes numbers 0-9. Comes complete with a frame and arrow that can be used to highlight a letter of the day! Includes numbers 0-10. Each 3-letter panel is 171⁄2" x 51⁄2". 13 pieces. 9 letter strips, 12-3/4' assembled. Number cards 0-10. 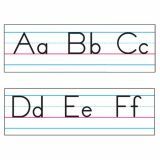 Use these alphabet lines to teach the alphabet and proper letter formation. 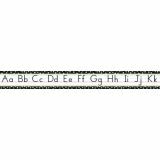 Each alphabet line measures over 14' long when assembled. Seven 24 1/4" x 7 5⁄8" strips per pack. 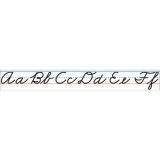 Inspire miles of smiles while mastering cursive writing. 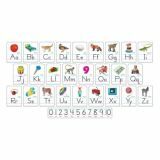 Includes uppercase and lowercase letters on 6 letter strips and numbers 0-10. Complete set 6¼ in. x 15½ ft. 7 pieces. Learning Fun Activities included in Discovery Guide. 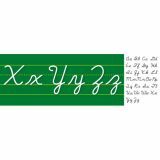 Perfect for use on a magnetic whiteboard! 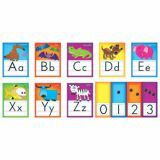 Display upper- and lowercase letters A-Z plus numbers 0-9. 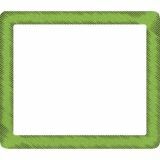 Small sets include 5 strips, 1 1⁄2"W x 1' each. Large sets include 5 strips, 3" W x 2' each. Photographs provide sound/letter cues. Includes numbers 0-10 and a Discovery Guide filled with information and activities. Pieces are 5 3/4” x 8 1/4”. Assembled line is 14 1/2' long.